Hosting a successful wine event is a bit like piecing together a giant puzzle. You have to pick the right venue, the right time of year, the right sponsors, the right vendors, and target the right audience with your marketing. You also have to juggle all sorts of logistical challenges like payment processing, permitting, and ticketing. And while there is no foolproof formula for hosting a successful wine event, there are several things you can do to stack the odds in your favor. Below you’ll find 5 tips for hosting a successful wine event and to help you streamline the planning process right up through the day of. People come to wine events to sample a variety of styles, vintages, and wineries. It’s a wonderful way for wine enthusiasts to find something new they love without betraying old favorites. But it’s difficult to make money by giving away samples. Sure, you can charge per glass or come up with a chit system, but the vast majority of your profit will come from actually selling wine. In the initial planning phase that means you’ll have to scout out brands and wineries that are popular. Do some research in your local market and choose the best producers for your next event. You’ll also want to ensure that your vendors have enough product on hand to take care of all the customers you expect to come through the door. Ticketstripe helps you accurately plan for attendance by delivering Real Time ticket sales tracking data—so you always know exactly how many tickets you’ve sold. Another way to make your event a success is to attract the right type of partners. Vendors, and media partners will all shoulder some of the burden of pulling off the best wine event possible. Whether that means marketing to their existing customers, delivering the best quality product possible, or simply lending their brand name to your event, your partners can literally make or break your event. So what makes a good partner? Look for well-known names in your area (whether it’s wineries or media partners). You want that brand recognition to work for you. Ensure they have the pull necessary to do what you need them to. That might mean researching their current customer base or digging into their financial capabilities a bit. You need someone who can invest the time, effort, and funds you need to make your event a success. Always look for enthusiasm. If your partner isn’t as excited about the event as you are, they’re not going to pull their share of the burden. Stay away from low-quality partners. You don’t want to team up with mediocre partners if you’re trying to attract higher-end guests. Those guests are affluent enough to spend a little more, refined enough to have fun but remain civil, and socially connected with like-minded individuals who they’re likely to tell about your event. Venue is so important to the success of your wine event. You need to find a venue that encapsulates the right location, capacity, and ambiance of your vision for the event. Look for the opportunity to house your event outside (but beware the weather). Barring that, look for spacious, well-decorated venues that can be transformed into an oasis. And, if possible, choose a venue that’s next to amenities your guest might like (the interstate, good hotels, nice restaurants, local attractions, etc.). If you need to spend a little more on a better venue, it’s probably a good investment. Ticketstripe can help there as well. Your Stripe merchant account will deposit funds 2 days after each ticket sale into your bank account so money is at your fingertips if you need to reinvest in more marketing, better decorations, a bigger venue, or any of the hundreds of other valuable improvements you could make to your next wine event. Determining ticket price can be tricky. You want your tickets priced low enough to generate a significant amount of sales but high enough to weed out demographics you’re not targeting. As a general rule, $20 to $30 is a great place to start. But, you can also use additional pricing strategies to boost revenue and attract a better targeted guest (one who is likely to spend more once inside). 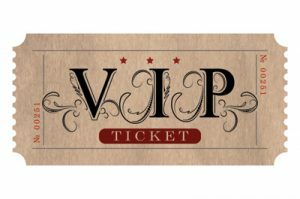 Creating VIP packages, special “members only” tickets, and other promotional passes is not only a great way to generate buzz for your event but also to increase your profitability. You can use the upsell packages as promotions, or target them at serious connoisseurs. VIP perks can include early entrance, reserved parking, exclusive areas, exclusive offers, special seminars and talks from industry insiders—the sky really is the limit. And if you create a ticketing scale with multiple tiered packages, you can tap into every level of your potential market and double or even triple your ticket revenue. 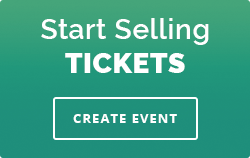 With Ticketstripe you can create as many ticket types as you want, including hidden tickets (tickets not visible to the public through your event page). You can use these hidden tickets for special segmented promotions. Finding the right sponsors is another way to ensure the success of your next wine event. It’s great to have a ton of local sponsors, but having one or two “Big Fish” sponsors can really put your event over the top. These regionally or nationally recognized brands have tremendous cache with wine enthusiasts already. In addition, they have the freely available funds you’re going to need in the early stages of your planning. Don’t know who to pursue? Reach out to your local marketing council so you can pair with brands whose interests, audience, and energy overlaps (but doesn’t compete with) your own. How can you convince these Big Fish? Many times it boils down to “what’s in it for me?” If you can present a persuasive picture of what they can get out of your event (usually money and increased brand lift) you can often convince even the most jaded potential sponsor to partner with you. All of these previous tips will help you lay a solid foundation for your wine event. But in order to ensure it’s a success, you need to wisely and aggressively promote it. While traditional outlets (TV, and radio) are still a viable option, you should consider investing heavily in social media marketing as well. Your Ticketstripe private-branded event page comes with built-in social tools making sharing near effortless. 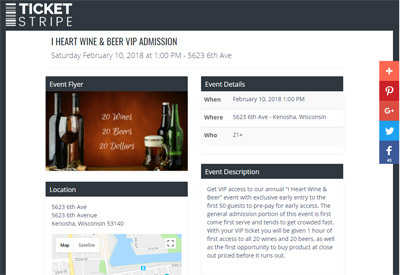 Your responsive and optimized event page showcase your name, logo or event image making it easy to turn potential guests into trusted marketers. 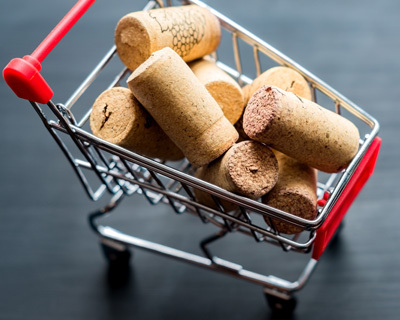 By convincing these guests to advertise for you (via social sharing with their friends) you’re gaining access to a network of prequalified wine enthusiasts that you wouldn’t have had otherwise. Whether you choose to focus on traditional media, social media, mobile marketing, or all of the above, Ticketstripe’s Real Time sales data can keep you in touch with how many tickets you’ve sold to date and from what source. With effective marketing in place, all you have to do is handle the day of logistics to ensure a smooth customer experience.